Please read my FAQ before contacting me. What's new in my pocket computers pages? Device securised this morning! No page for it yet; will be one some day. Created a page for the Sharp MI-10 i've received. My collection reached 49 units yesterday as i've received 2 new watches. Added them to the list (no pages yet) and changed the homepage to a weblog format. I'm sorry, but I will not reply to user manual requests or to dealer location inquiries anymore. Please read my FAQ page that might help you if you have any of these questions in mind. Feel free to contact me for any other question or comment regarding this machine! The Omnigo and it's two modes : keyboard and tablet. - Introducing Graffiti writing recognition! Now that's one *very* interesting machine. Plenty of good ideas, most of which were ahead of its time. 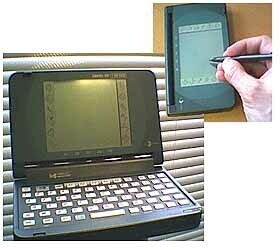 Released at the time when Apple launched the PDA concept with the Newton; the Omnigo brought a more "computer" vision of PDAs. It was using GEOS (a mobile OS that lived up to the 21st century in NOKIA 9000 and 9110 products, and was also used at that time in the Casio Zoomer) and GRAFFITI for data input, long before Palm made the success we know with Graffiti devices. But the most interesting part of the Omnigo was the "2 in one" concept : designed as a PDA, it was made to be used in one hand with a stylus for input and navigation. But HP had the luminous idea to include a keyboard. Use the keyboard for data input, or fold it 180 degrees to have a compact unit for data navigation. A function key allows for the screen display to turn 90 degrees depending on the use, and the functions icons are designed in a way that make them easy to read in both position. The idea of a "hidable" keyboard in the PDA is years later coming back through Sharp Linux PDAs, and, along with Graffiti and the standard DOS-like OS counted among the 3 excellent ideas of HP for this products. It's Interesting to note that this idea appeared on this machine long before Sony, then Sharp adopted a similar concept on some of their PDAs. Graffiti Handwritting recognition; Geos OS; Telephone directory; schedule; calculator; computer connexion; world time, notepad, financial app; spreadsheet; Database manager.